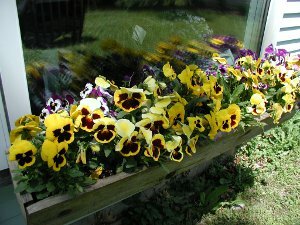 Pansies or violas are one of the earlier blooming plants. Along with spring bulbs, they provide a welcome show of color after a gray winter. They come in a wide variety of colors with purples and yellows being the predominant colors. Many are bicolor. More than that, these beautiful flowers also love the fall. They grow well in the cooler weather and will withstand light freezes; so many people also plant them in the fall replacing summer annuals that are past their prime. They are hardy in zones 4-8 so fall plants will usually come back in the spring. They also will seed and naturalize themselves. They like soil rich in organic material, and do well in planters as well as the flower bed. These flowers are biennials, but they are usually grown as an annual. They can, under favorable conditions, be grown as a perennial. They tend to start looking a bit scraggly after a few years, however. There are also varieties that have been bred to flower the first year. For fall flowers, start them from seed in mid-summer and they will be ready to go when the cooler fall temperatures arrive. Plants for the spring should be started 6-8 weeks before the last frost is expected. The seeds will germinate in a couple of weeks at 65-70 degrees and should be kept at around 50 degrees once they have germinated to encourage stocky plant growth. When purchasing pansies from the garden center, the usual guidelines about buying nursery plants should apply- look for plants that are stocky with plenty of flower buds. Plants that have a lot of flowers or are tall and leggy may have been stressed and don't represent the best value. We usually get some for our window boxes in late winter from the garden center and they do well until May or June when the hot weather knocks them back a bit. We have had some luck with moving them to a shady, out of the way place and bringing them back in the fall. Check with your local garden center for advice on what plants grow best in your local climate.